I seem to be on an Indian bread / flatbread roll at the moment :) A while ago, I had spotted someone posting a picture for Methi Pooris and ever since, I've thought about them every once in a while when I try and work out what we're going to have for dinner. What are Methi Pooris? 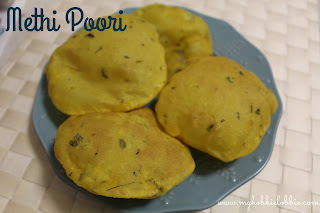 Pooris are little deep fried flatbreads. Methi is nothing but fenugreek. So basically, these are just little deep fried flatbreads with a little fenugreek in them. Now, not always, do these thoughts get acted on, but not this time. This time, I am proud to say I actually made these pooris. I did a little reading up on them and with every recipe I read, I found myself with a little ingredient hurdle I wasn't going to conquer. So on went my thinking cap and I decided that I was going to bravely venture into conconting my own version of the pooris. I took bits and pieces from 3 different recipes that I thought would work together, made a few minute changes and was very happy with the result. I didn't get any step by step pictures this time, since I wasn't sure how well the pooris would turn out. But when we tasted them, I knew I had to share this recipe with you as soon as I could. So, if you are looking to add a little variety to your routine Indian meals, try this out. A lot of folks make the pooris using fresh methi / fenugreek. I didn't have access to any, so I replaced it with some Kasuri Methi / dried fenugreek leaves. These are readily available in any Indian grocery store and keep well for months. I served this up with some Aloo bhaji, or mildly spiced Indian curried potatoes. You can find the recipe for that here. If you'd like to try the basic poori recipe, the plain one, you can find it here. If you're a noob at cooking Indian food the potato stir fry is a good place to start. It is nothing more than a quick stir fry and if I can make it, anyone can :) So don't let the thought of cooking Indian food scare you. Give these recipes a try and you'll be hooked. Mix the whole wheat flour, all purpose flour and salt in a large bowl. Place the kasuri methi in your palms and rub a little to release their flavour. Sprinkle over the flour. Tip in the turmeric powder and mix everything together. Add the yogurt and stir through. Gradually add a little water and knead to a soft, pliable dough. Add the water gradually as you don't want to end up with a sticky dough. If the dough turns out too sticky, sprinkle a little flour over and knead it in and you should be good to go. Cover with a damp cloth and let it rest for about half an hour. Heat the oil for deep frying over medium heat. When golden brown, drain on absorbent kitchen paper. I like poori. I like your blog. i will try to make this dish. poori is good for health. Thanks for sharing.